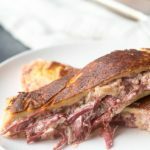 This Keto Turkey Pot Pie is the perfect family recipe for left over turkey or even chicken! 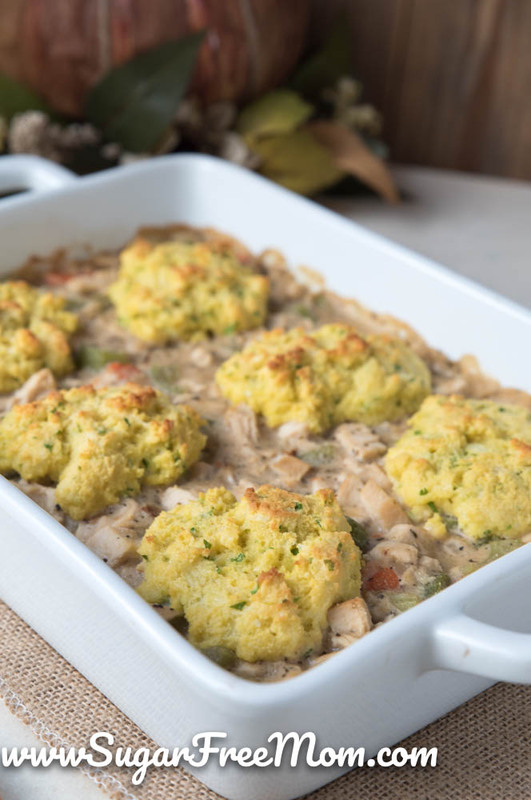 It’s gluten free, low carb, and nut free, making it an easy turkey pot pie to serve to guests with allergies! 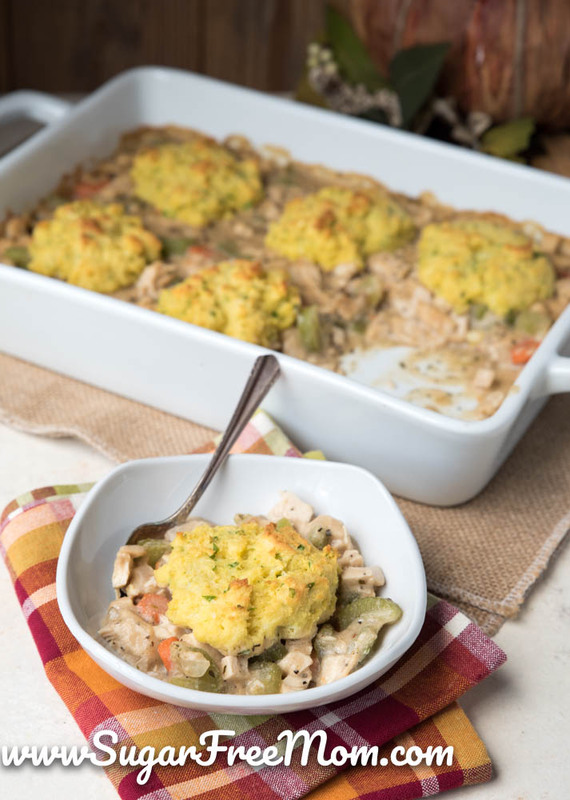 This turkey pot pie recipe is one of the easiest ones you’ll find! No need to make a pie crust and a top layer. 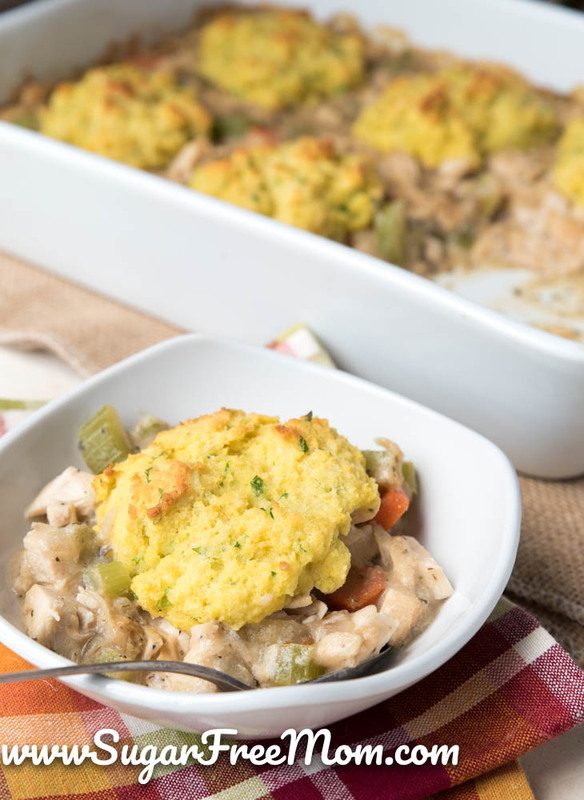 Just top with these easy low carb drop biscuits which makes life a whole lot easier to feed a family with leftovers from turkey Thanksgiving. I adapted this recipe from one I made years ago that was gluten free but not low carb. 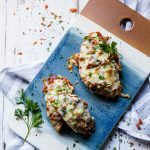 The filling was easily adapted without potatoes and the biscuits were delicious but not low carb. 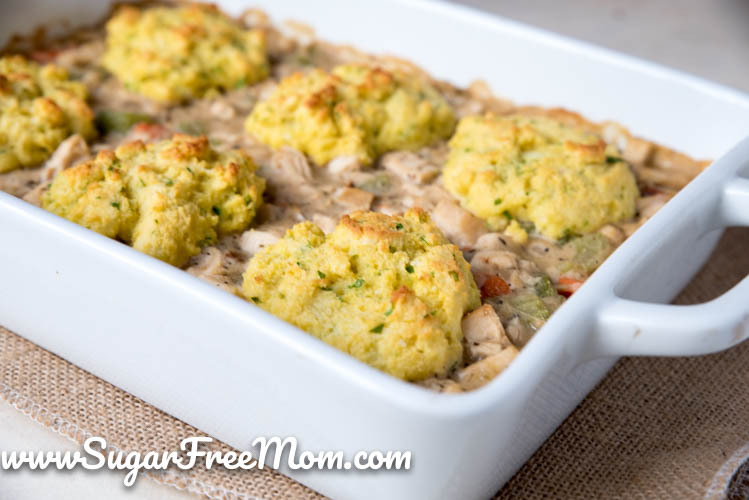 Feel free if you’re not low carb to check out my first Turkey or Chicken Pot Pie recipe. Anyway, regardless if you’re low carb or not, this recipe is delicious and helps use up left over turkey or chicken. 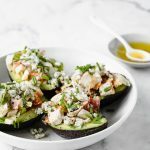 Adding in a few simple ingredients and pantry items you most likely have in your kitchen, nothing fancy here folks, and you’ve got a winning recipe the whole family will devour! 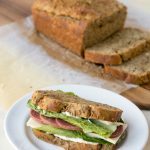 It’s simple, it’s nutritious, it’s comforting and it uses left overs! How could you not love a recipe like that? Unless of course you’re not eating turkey on Thanksgiving? Well, then try it with ham? Ham pot pie? Maybe? Maybe not. I’m not quite sold on that, but I have made with with left over chicken breast and it’s just as good! Place celery, carrots and broth in a large pot and bring to a boil. Cover and simmer until tender, about 10 minutes. Place oil and onion into a large skillet and cook over medium heat until onion is tender, 4-5 minutes. Sprinkle coconut flour over the onion then add in the heavy cream. Stir together until mixed. Add in the broth, carrots and celery into the skillet. Sprinkle xanthan gum over the vegetables and broth in the skillet. Bring to a boil, reduce to medium low and continue to stir until mixture starts to thicken, about 10 minutes. Once thickened, turn off heat and add in turkey and seasonings, taste and adjust salt and pepper if needed. Pour into a 9 by 13 baking dish. Preheat oven to 375 degrees while you make the biscuits. In a large bowl whisk flour and dry seasonings together. Stir in the melted butter until combined, work out clumps. Stir in eggs, fresh herbs and cheese. Make large 6 free form mounds and drop on top of pot pie. Bake 20-25 minutes or until biscuits are golden brown. This looks fabulous! 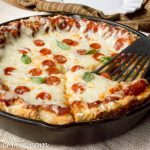 I have been looking for a good recipe for low carb pot pie. One question: do you taste the coconut flour in the biscuits? I have never liked the taste of that flour in baking. 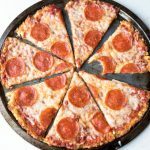 Thank you for sharing your yummy recipes! My youngest son hates coconut and doesn’t complain eating these are noticing a coconut flavor. I’m wondering if it would be okay to skip the Xanthum gum since it’s only 1 tsp. Could I sub in corn starch? I just hate to buy ingredients I”ll onlyuse for one recipe. Thank you! You could swap it with corn starch. Can I omit the cheese in the biscuits? I am dairy free as well. I just made this and it’s cooking. You say it’s 6 servings but when I got done making the biscuits it said drop 8 mounds instead. My casserole dish would not hold 8 anyways. Was this just a misprint? I can smell it cooking. I have been waiting all day! Yes that was a misprint, thanks for noticing! I have just 6 mounds of biscuits in my pics.